The "Old World Warblers," when assigned to the traditional family Sylviidae, once included ~400 species, the second largest family in the world. New molecular information has shown that this huge "Old World Warbler" assemblage actually represented a dozen different major evolutionary lineages; Alström et al. (2006), Jønsson & Fjeldså (2006), Barker et al. (2004); for an overview see a discussion of the Break-Up of the Old World Warblers. Alström et al. (2006) began the inevitable process of breaking them up into new families, proposing Family names for several of the lineages and leaving others for later studies. They proposed the Family name Cettiidae for a group of diverse 'warblers' from Eurasia, and even a couple 'tailorbirds' from the Orient. Together, these might now be called the Cettid Warblers, or, more simply and accurately, Cettids [pronounced "Chet-ids"]. Others later pointed out that "Cettiidae" had never been formally proposed under nomenclatural rules, so the fall-back is now (2017) the Soctocercidae (Winkler et al. 2015). Perhaps the 'core' group in the Cettiidae are the 16 species of bush-warblers in the genus Cettia. These are notorious skulkers, often heard but seldom seen. An example is Philippine Bush Warbler (left), endemic to the mountains of northern Luzon, Philippines. In this lucky shot, we see they shy bird spreading its wings and sun-bathing in a sunbeam penetrating the otherwise thick undergrowth. This species is presumably not photographed often. In English parlance this family is often called "Bush Warblers & allies," and there are about 16 species whose English name is "Bush Warbler" in this set. However, there are about a dozen or "Bush Wwarblers" in family Locustellidae, most of them in genus Locustella. So it is probably better to call our group Cettids. The Clements world checklist (2011 update) attempted to bring better clarity to the English names of various skulking "warblers." A number of African Bradypterus warblers were once called "bush-warblers" also, but they are now all termed "swamp warblers," "rush warblers," and other more descriptive names. Unfortunately, this leaves both Cettid "bush warblers" and Locustellid "bush warblers" in tropical Asia. Both types of "bush warblers" are once seemed related on their dull appearance and secretive behavior (e.g., Cettia and Bradypterus are discussed back-to-back in a "traditional" sequence, as in Bairlein 2006), but this is simply convergent evolution in unrelated sets of small birds (e.g., Alström et al. 2011). Some global checklists (e.g., Clements) are working to restrict Bush Warblers to this family [Scotocercidae] alone. 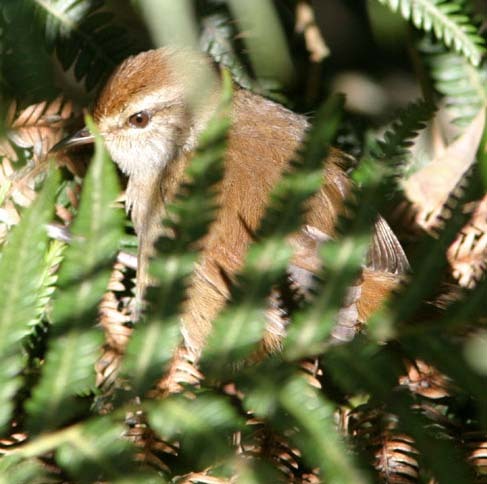 The initially proposed family name "Cettiidae" was derived from the first described bird in this set, Cetti's Warbler (right, in a marvelous shot by Graham Catley). This is a breeding bird of reedy swamps from western Europe (including Britain) and northwest Africa across to northwest India. Western populations are resident, but many eastern populations are migratory. It is a skulker, more often seen than heard. As the molecular evidence accumulates about this family and we learn of the true relationships, it may be that the genus Cettia itself will be restricted to this single species (or a few at most; currently in 2012, many species are included in Cettia). The bird's behavior in Graham's photo reminds me of the characters (cocked tail, aggressive stance, large feet, retiring nature) that typify Marsh Wrens here in America. There are a series of ground-hugging forest species in the Cettiidae, including the nearly tail-less stubtails (3 species in genus Urosphena) and tesias (5 species in Tesia). Stubtails, like Bush Warblers and Cetti's Warbler, are generally plain, brown, and unremarkable in appearance, but Tesia are different. They can be remarkably colorful, as exemplified by Chestnut-headed Tesia (left, in a magical shot by Ramki Sreenivasan from India). This is a tiny little bird creeping around the jungle floor, and a great treat to encounter. The Cettiidae is almost entirely a Eurasian family but there is a forest floor skulker in the heart of Africa — Neumann's Warbler Hemitesia neumanni of the Albertine Rift. It is most likely closest to the Oriental stubtails, although still somewhat distant; Irestedt et al. (2011). Those authors called it "the sole African member of a Palaeotropic Miocene avifauna." This might mean, however, that the Cettiidae arose in Africa and then expanded to Asia, with various African species thereafter becoming extinct, leaving only Neumann's Warbler as a relict. Earlier suggestions that this family might include such African species Green Hylia Hylia prasina, or the Eremomelas, were wrong. Hylia is apparently a long-evolved lineage and may warrant Family status [tentatively so here], while the Eremomelas are cisticolids. There are still some other African birds that are closely related to cettids (see below). Another surprise revealed by genetic research was that the tailorbirds were not a unified group. Some tailorbirds proved to be closely related to cisticolas and prinias [family Cisticolidae] but the two Phyllergates tailorbirds in the Orient proved to be cettids. 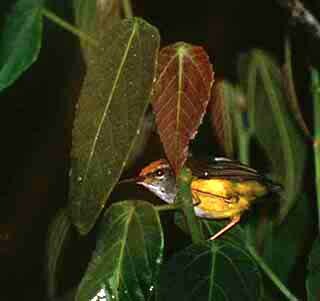 One of these is Mountain Tailorbird (right), which ranges from southern Asia to the Philippines and Wallacea. These tailorbirds had previously been assigned to genus Orthotomus (see Alström et al. 2006). Thus not only are tesias an example of colorful cettids, but so are these two tailorbirds (the other Phyllergates is Rufous-headed Tailorbird P. heterolaemus of the Philippines). While there are many places where these tailorbirds are undergrowth skulkers, they can be found in canopy of some montane forests. The full parameters of the rest of the Cettiidae is starting to come into focus (Fregin et al. 2012). In addition to those discussed above, it includes Broad-billed Warbler Tickella hodgsoni, three warblers in the Asian genus Abroscopus [Yellow-bellied Warbler A. superciliaris, Black-faced Warbler A. schisticeps, and Rufous-faced Warbler A. albogularis]; and the Scrub Warbler Scotocerca inquieta of north African and the Middle East (Alström et al. 2011a). A year later, Fregin et al. (2012) proposed treating the genus Scotocerca as a separate family "Scotocercidae." [Ironically it later became the name for the full cettid family because "Cettiidae" was never properly proposed under formal rules.] Fregin et al's proposal was based primarily on a "long internode" in the phylogeny of the family. 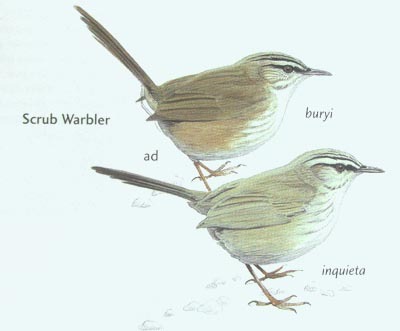 The authors published evidence at Scrub Warbler (left, artwork of two races by John Gale) was sister to the rest of the "Cettiidae" but there are hundreds of instances in the avian tree of life where a single taxa is sister to a related clade of species. In my view, this is hardly a reason to raise Scrub Warbler to a monotypical family level. It is a dull, skulking, wren-like "warbler" of desert scrub, not particularly distinct from other retiring cettids. Yes, it proved not to be related to the Cisticolidae but has evolved a convergent lifestyle. I leave it among the "Cettiidae" [today's broadened Scotocercidae], possibly as a subfamily. Fregin et al. (2012) also proposed treating the genus Erythrocercus — three "flycatchers" from sub Saharan Africa — as a separate family, Erythrocercidae. These birds are sister to the clade of Cettiidae plus Scrub Warbler. One reason for separating them is that they have 12 rectrices rather than the 10 which the other Cettiidae (including Scrub Warbler) have. Further, they are African rather than Asian; they are apparently rather ancient (although Fregin et al. 2012 did not give us a time estimate); and they are distinctive and diagnosable. I have tentatively accepted this proposal and have named this set Bristle-flycatchers. See that web page for more details. If this proposal does not gain wide acceptance, the bristle-flycatchers in genus Erythrocercus will likely become a subfamily of the Scotocercidae. Photos: The Philippine Bush Warbler Cettia (may become Horornis) seebohmi was in the undergrowth high on Mt. Pollis, Luzon, the Philippines, on 31 Dec 2005. 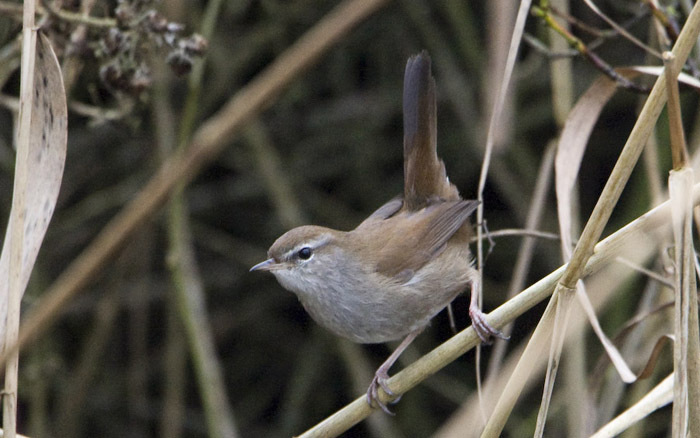 Graham Catley photographed the Cetti's Warbler Cettia cetti in Lincolnshire, Britain, on 27 Jan 2011. 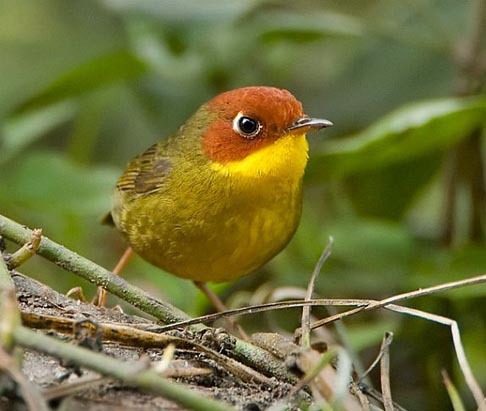 Ramki Sreenivasan photographed the Chestnut-headed Tesia Tesia (or Oligura?) castaneocoronata in Corbett NP, India, in Feb 2010. The Mountain Tailorbird Phyllergates cuculatus was foraging just off my balcony at the hostel in Mt. Kinabalu Park, Borneo, Malaysia, in Aug 1988. Photos © Don Roberson except those attributed to and © Graham Catley and © Ramki Sreenivasan, and used with permission; all rights reserved. The artwork of Scrub Warbler Scotocerca inquieta by John Gale is from Birds of the Middle East, 2d ed., by R. Porter & S. Aspinall (Princeton Univ. Press). Bibliographic note: There is no "family book" covering the cettids so information must be sought in a variety of texts, including the HBW species accounts of sylvioid warblers in Bairlein (2006). Alström, P., P.G.P. Ericson, U. Olsson, and P. Sundberg. 2006. Phylogeny and classification of the avian superfamily Sylvioidea. Molec. Phylog. Evol. 38: 381-397. Alström, P., J. Fjeldså, S. Fregin, and U. Olsson. 2011a. Gross morphology betrays phylogeny: the Scrub Warbler Scotocerca inquieta is not a cisticolid. Ibis 153: 87-97. Alström, P., S. Fregin, J.A. Norman, P.G.P. Ericson, L. Christidis, and U. Olsson. 2011b. Multilocus analysis of a taxonomically densely sampled dataset reveal extensive non-monophyly in the avian family Locustellidae. Molec. Phylog. Evol. 38: 381-397. Bairlein, F. 2006. "Family Sylviidae (Old World Warblers)," pp. 492 –712 in Handbook of the Birds of the World (del Hoyo, J., A. Elliott & D.A. Christie, eds). Vol. 11. Lynx Edicions, Barcelona, Spain. Fregin, S., M. Haase, P. Alström, and U. Olsson. 2012. New insights into family relationships within the avian superfamily Sylvioidea (Passeriformes) based on seven molecular markers. BMC Evol. Biol. 12: 157-179. Irestedt, M., M. Gelang, G. Sangster, U. Olsson, P.G.P. Ericson, and P. Alström. 2011. Neumann's Warbler Hemitesia neumanni (Sylvioidea): the sole African member of a Palaeotropic Miocene avifauna. Ibis 153: 78-86.
page created 12 Sep 2004, revised 27 May-8 June 2006, 8 July 2012, 3 Sep 2012, 16 Nov 2012, and 25 July 2017.